SeaDream Yacht Club set up shop in August 2001 and a month later took possession of two luxury ships originally known as Cunard's Sea Goddess I and II. The owner of SeaDream is Norwegian industrialist Atle Brynestad, at one time the largest shareholder of the old Royal Viking Line and the founder of Seabourn Cruise Line, which opened its doors in 1987. SeaDream promotes its style of cruising as "yacht-like" with a "resort-casual" dress code (read: no formalwear required) and upscale cuisine and amenities. "We are not a cruise line" is the mantra repeated by top executives who also tout the hallmarks of the vessels: "unstructured and free-form." That means itineraries are somewhat flexible, allowing the captain to linger in a port if passengers wish or to depart early if rain spoils plans. Beverages, shore excursions and tips are included in the cruise fares. Seating is open for meals, and Champagne is always available -- even in the surf during beach visits. Caviar used to be offered on tap but is now kept for special occasions, such as the weekly Champagne Splash party. 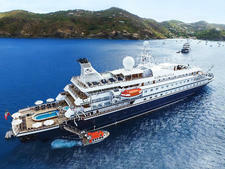 What really differentiates SeaDream is superb service that's attentive, proactive and friendly without being obsequious. The relationship that passengers form with the crew is part of the experience, too. It goes beyond the waiter remembering your name; it's when the maitre d' says to you at breakfast, "There's a full moon tonight, so I've found you a nice, private table on deck for dinner" that you know you're on a five-star ship. Casual, sophisticated and unpretentious, the SeaDream experience is highlighted by outstanding service, delicious cuisine and visits to ports of call where you'll rarely see another cruise ship. There's no dress code, but plan on "elegant casual" by day and, well, "casually elegant" by night. Women do dress up in cocktail dresses, so don't take "casually elegant" as a euphemism for turning up for dinner in shorts. Just don't bother to pack a tie if you're a man. All meals are open-seating, and many tables for two are available, which makes SeaDream a terrific choice for the romantically inclined. On the other hand, the ship's intimate size fosters a lovely community, and it's easy to meet others. Weather permitting, limited dining is available on deck. Tell the maitre d' at breakfast if you'd like a table outside that night. SeaDream is one of the more all-inclusive lines in cruising, so beverages (including cocktails), gratuities, equipment offered at the water sports platform and DVD's for in-cabin viewing are part of the fare. You will, however, shell out for treatments at the small but well-appointed spa, super premium liquors and wines, and shore excursions. On SeaDream's two yachts, a unique and popular activity is sleeping under the stars, either on the double Balinese loungers facing the sea, aft of the Top of the Yacht Bar, or, if you put in your request early, on the big, eight-person bed on the forward deck. Duvets and pillows are provided. It's first come, first served, but we didn't have a problem securing a bed for a night. What passengers tend to have in common is that they're well-heeled, well-traveled, sophisticated -- and laid-back. Ages range from 30 to infinity. Couples predominate, though you'll also encounter sophisticated solo travelers, as well as the occasional large group of family and friends. Two identical vessels, 110-passenger, 4,260-ton SeaDream I and II were built in 1984 and 1985 but underwent major refurbishments soon after they were acquired. Since then, the ships have undergone regular revamps to ensure quality maintenance, though no new major features have been introduced. The ships have no private balconies because the vessels were built before they became standard features; frankly, they're not really missed. There's so much deck space that there's plenty of room for passengers to find a nook or cranny outdoors. And cabins, which mostly feature portholes (with the exception of suites), have been so comfortably decorated with high-tech toys, luxurious bedding and bathrooms that offer two-person showers that they're genuinely cozy and welcoming. If nearly every aspect of SeaDream is a plus, this is potentially one minus: more than occasionally, the line will cancel a regular sailing if a charter gets booked -- and it can throw off vacation plans of individual cruise travelers. One debate you'll hear a lot on board is "Which of the two ships is better?" Every past passenger has an opinion, but the hotel manager on SeaDream II, who has served on both ships, told Cruise Critic that opinion is actually split straight down the middle; the ships are identical, and crew move around between the two. 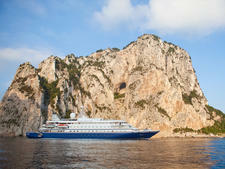 Most of the cruises are seven nights in length which is good for those for whom vacation time is at a premium. For those who want longer voyages, SeaDream's varying port of call schedules make SeaDream an attractive option for a back-to-back cruise, to the Eastern Mediterranean, Western Mediterranean and a combination of both). New for 2011 will be a short season for SeaDream I in Northern Europe, with two Norwegian fjords cruises and four in the Baltic. Both ships are in the Caribbean during the winter season.